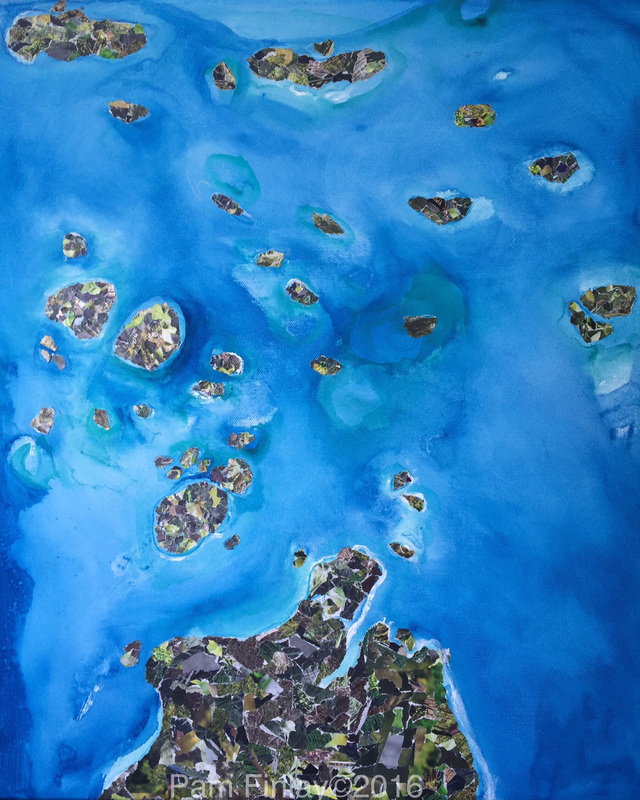 "The Islands of the Sea"
In my spirit I hear “Islands” as I am painting this picture of an aerial view of the Torres Strait, situated in a stretch of water between Cape York Peninsula and Papua New Guinea, the most northern tip of Queensland, Australia. The Lord has placed these islands on my heart since visiting Horn Island and Thursday Island in December 2015 for the “Creating an Atmosphere of Expectancy Faith Conference”. The ocean was painted first and then Holy Spirit prompted me to make the coastland from a collage of pieces, a mosaic of fragments unifying to make one whole. He placed the first two scriptures below on my heart as I was painting and stirred up excitement in my spirit while I read and He revealed more and more scriptures as I meditated upon His word. The word “Islands” is mentioned 35 instances in scripture. Upon research I discovered that in scripture “Island” is used as a symbol of the gentile nations. Isle or Island also means coastland. Jesus is recovering all. He is the restorer of all things. His holy remnant are gathering, bringing forth a declaration of praise, are stirred up with His zeal, are being filled with the knowledge of the glory of the Lord, believing in the truth and power of His word. By faith we obey. Our faith in God makes us whole. His word changes us. Jesus Christ is the strength of our life, He is our hope. In Him we can walk in newness of life. 10 And in that day there shall be a Root of Jesse, who shall stand as a banner to the people; for the Gentiles shall seek Him, and His resting place shall be glorious. 10 Sing to the LORD a new song, and His praise from the ends of the earth, you who go down to the sea, and all that is in it. You coastlands and you inhabitants of them! 11 Let the wilderness and its cities lift up their voice, the villages that Kedar inhabits, let the inhabitants of Sela sing, let them shout from the top of the mountains. The scripture from Isaiah 61 is also speaking to my heart. His people filled with everlasting joy, possessing double, such a glorious promise from the Lord. The greatness of our God. Glory, glory, glory hallelujah to the King of Kings and Lord of Lords. He rules and reigns and the whole earth will be filled with the knowledge of His glory. 1 The LORD reigns! Let the earth rejoice! May many islands be glad(ISV). Only in God’s garden can we find peace. Living in His rest there refreshes our thirsty souls. The door to His sacred garden is open, access is through obedience and faithfulness. In the beginning God desired for man to dwell in the Garden of Eden. He placed man there to tend and watch over His garden. There are different times and seasons in God’s garden. His garden dwells in our hearts, His Holy Spirit lives on the inside. Sometimes it is a time to plant, sometimes a time to water. Sometimes it is a time to cease from works and enjoy the rest. God has designed every person with a unique gifting to carry out His plan on earth. We all need one another to successfully fulfil His purposes for mankind. When we are faithful in following Him he causes us to flourish and grow. Sometimes He prunes us when we need to let go of things that are holding us back. Holy Spirit will encourage your soul to find rest. He prepares people to receive His word, offering His living water to restore your soul. He sows the word in our hearts. He cultivates His people to prepare them for a fruitful harvest. The gateway to this golden garden points to perfect rest. Walking through the garden and smelling the fragrant aroma, this is the perfect pathway to wholeness. A place of sunshine, the light of Christ shining brightly within, that’s the way to fruitfulness, the heart stepping into the eternal, laying our burdens at Jesus’ feet and living a glorious life, that's paradise. "A Plate Fit For The King - Heavenly Manna"
Jesus is extending an invitation to come dine with Him at the Banquet table. There is awesome food, 3 Tiers, levels, realms of understanding, body, soul, spirit. The third tier heavenly, being pure sweetness. Come and feast at the Banquet table, being willing and obedient to the Lord. Come eat of His heavenly delights. His word is awesome food for your soul and spirit, eternal food to nourish you forever. You will never go hungry. Behold I stand at the door and knock. If anyone hears my voice and opens the door, I will come in to him and dine with him, and he with me. Luke 14:15-24, Is 25:6, Ps 23, Is 1:19, Is 55: 1-2, Joel 2:24-26, Rev 7:16-17, Matt 22:1-14. Banquet is mentioned 72 times in the bible ( I am sure through seeking these scriptures God will reveal much more). The table is set. There is an invitation by Christ to attend His banquet supper. I am ready to come dine with you Lord with all joy.